Play the #1 MOBA in style! GameSync – considered one of the highest quality fiber LAN centers in the world – offers spectacular League of Legends performance on our Enterprise network which is dedicated solely for gaming, with average ping times to the NA server of 58ms (the best possible) and rigs that support high frame rates at max settings. Playing in our comfortable, purpose built environment has many other benefits including 5v5 capability, premium hardware & peripherals, and extended weekend hours for late-night gaming. Most of all, it’s incredibly fun! Most people aren’t content just sitting at home alone all day: they want to get out and enjoy other environments with other people around. At GameSync, the cheering, comradery, sharing strategies/ideas, screen sharing, talking about other things, taking breaks together, etc. is all more enjoyable. Plus the adrenaline rush on LAN is much more intense! Enjoy your matches hassle and worry-free in our arena. These and other problems can render the game literally unplayable and cause endless frustration. Our state-of-the-art rigs, maintained daily, run perfectly. League’s social team building aspect is perfect for our game center. 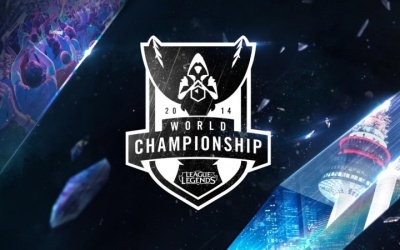 Are you itching to meet other LoL fans in a fun environment? We’re the only group of gamers hosting a weekly place to gather while highlighting skilled and innovated players in the community. Practice during the week, then bring in your team and compete or join up with others. From 4PM until 2AM (or later!) every Saturday night, year-round. Our LAN center is frequented by former and current eSports pros who are still very active in the scene. These players are all at a minimum level 30, diamond, and some are in the top 500 worldwide. Keep your eyes open: you never know who you’re going to meet and learn from at GameSync! Team building is a requirement for success, and at our meetups you get the opportunity to play LAN games with or against the same group of people. After each game you can talk “strats” and good plays and improvements. Then you “run them back” (after break/discussion, you go back and play again with the same team(s) and see how that benefits game play). You’re invited to experience state-of-the-art gaming in our dedicated arena. If you’ve never been, come in for a free hour and bring friends – they’ll each get a free hour plus so will you! We also have reasonable pricing and student/military discounts. Plus the game is completely free to play, which makes playing at a LAN center more affordable. FREE giveaways, tournament announcements, game discussion, & much more! Our game stations, peripherals, and enterprise-class network infrastructure are beyond superb. Selected from our decades of custom computer building and repair experience under our “San Diego PC Help” brand name, our stations are continuously being upgraded as the technology improves. Our top-tier peripherals are hand-picked by the most serious of gamers on our team. Try on a pair of these optically precise, image enlarging gaming glasses – they’re the same ones worn by the pros. Gunnars also block harsh blue light and glare so your eyes can finally relax. They’re free to use – ask for them when you check in. Scrim, compete in on-line and local tournaments, improve your game play, KDA ratio, & win rate, learn new strategies, and meet passionate players from around San Diego. All skill levels welcome! Every Saturday starting at 4pm year-round! It largely depends on the number of hours desired. Check our pricing and deal pages for all the details! I’m diamond, will I be the only high rated person there? The distribution of players varies enough so that no one player is too far superior to others. I’m an average player. Can I still show up? Usually it's friendly/playing for fun but with a large number of people it can turn competitive. Up to you! Is a bit of playful toxicity accepted? Since it's all in good fun, absolutely! Do you only cater to groups or do you welcome single players as well? We serve anyone who is inspired to play! Can I bring my own setups? While most players find our gear more than satisfactory, of course you are most welcome to bring your own. How can I coordinate or carpool with others? Our forum is a great place to meet other players and organize transportation. How can I find a team to practice and compete with? We help coordinate teams of local players who are inspired to get serious. Read more on our eSports page. Having put thousands of hours into the game, we thought it was time to contribute back to the community with helpful articles for you to enjoy! We’re looking for more writers! If you’re knowledgeable about the game, please contact us. Join one of our local eSports teams and get serious with your game! 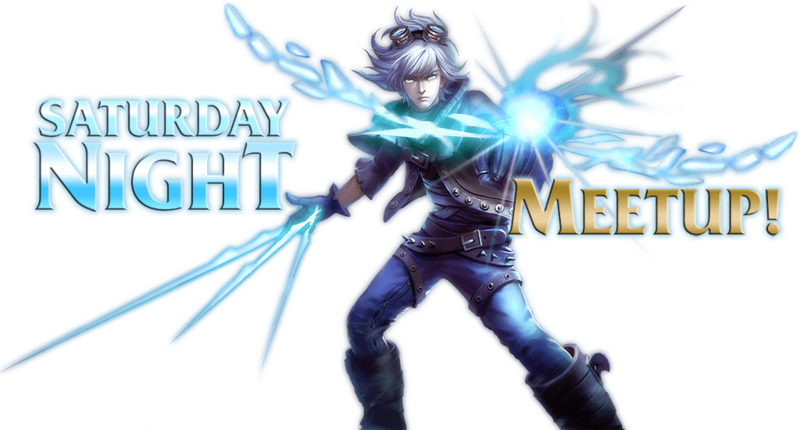 FREE giveaways, tournament announcements, game discussion & more! Check out all the ways you can play on a budget and save at GameSync. 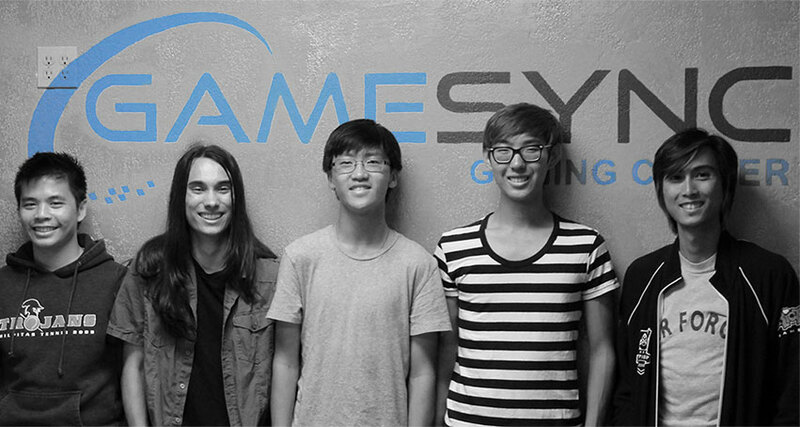 Learn about the people behind San Diego’s new League LAN scene & our future plans. First there was a game simply known as defense of the ancients. 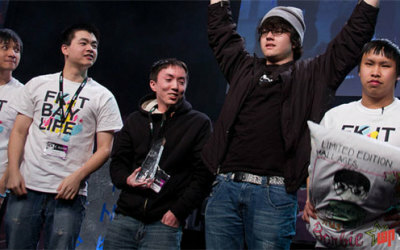 Then there was League of Legends. League of legends has found itself a unique place in pop culture, a place that only huge games from large well know companies have found themselves in the past. League is literally everywhere, if you were to go up and talk to Even people who don’t really consider themselves as gamers find that they too are wrapped up in League of Legends. League of legends also finds itself with an extremely active, and creative fan base, that consistently delivers amazing pieces of fan art, and literature, for the community, and all of the world to enjoy. League of Legends borrows many of its ideas about basic character design, and game play, from Dota. That being said League of legends makes an exceptional effort to make not only the game play, but the aesthetics, all about the champion. 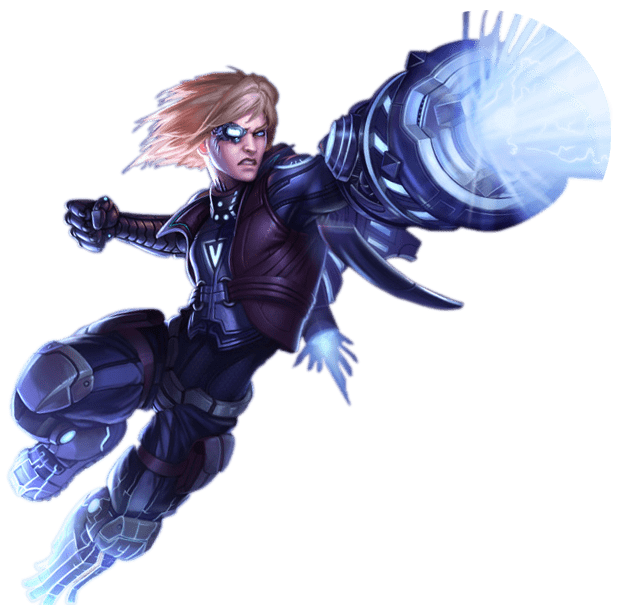 Speaking of aesthetics, and character design, this game has a lot of both, while some champions are almost directly borrowed from Dota, the game attempts at making unique and interesting characters, and equally as good stories behind them, which was something that DOTA really lacked in. 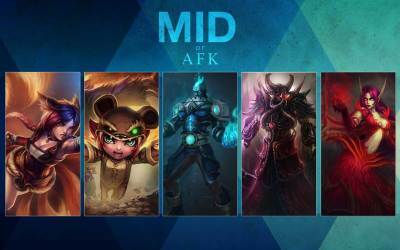 League of legends has also made the moba genre which quite literally was the hardest genre to get into, and play, more approachable, and easier to pick up and play. 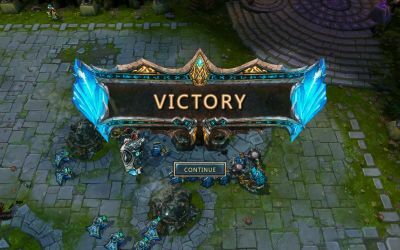 Doing so has certainly been quite a gain for the Developer, and publisher, Riot Games, as League of Legends, finds itself being one of the most profitable games that uses micro transactions as a main source of revenue. 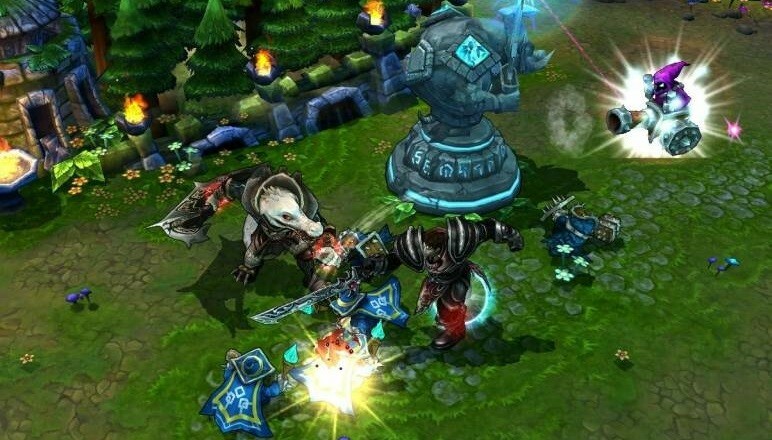 League of legends finds itself taking most of the root themes, and tropes from standard fantasy. However, LoL crosses over into other genres, and they even do a bit of their own thing. 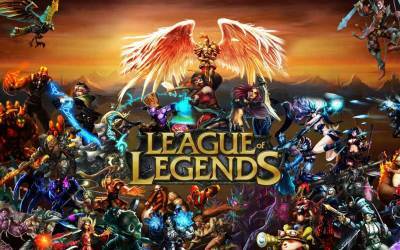 ESRB Rating: T for Teen League of legends is a fast paced (MOBA) Game, where you control one of many champions on the fields of justice. We honestly used to think that League of Legends was nothing more than a fisher price baby moba game, and that HoN and DoTA were the only ones that had challenging game play mechanics. To a certain point this is true, League of legends has much more simple mechanics then either DoTA or HoN, and as such it makes the game more accessible. However, we failed to realize that having ridiculously complicated mechanics doesn’t make it a better game. After a while we figured that each game had their place and excels extremely well at what they do. DoTA is the biggest monster meta game management simulator ever, and League of Legends is a more accessible, simpler game, but yet is deep in its own way. League of legends perhaps has one of the most unique assortment of characters in any game, all without breaking the theme. Every character has a unique style of play, as well as interesting and character design. While most of the characters are unique and remarkable in their own way, these are some of the characters that we believe stand out above all of the rest. A small Yordle Commando with an abnormally warm personality, that shuts down when he is on the battlefield. Teemo’s moves complement his status as a commando well, by revolving around disabling the opponent. He also is able to become completely camouflaged, and gains a huge attack bonus when he comes out for a surprise attack. A Female Yordle commando who trained for her whole life to get where she is now. Tristana’s movesets on the surface just seem like what is described as a Megling Gunner, all of her moves resemble actions, abilities, and power ups from classic arena first person shooter games from the 90’s which makes for a very interesting and unique character. An armadillo turned magical and sentient after a strange happening in a grassy maze. 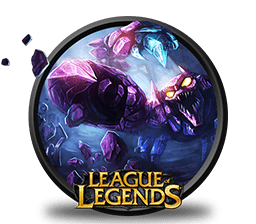 Rammus’s abilities involve shaking the ground, and taking advantage of his spiked durable exterior for the benefit of his teammates, and the detriment of his enemies. Ahri was a magical fox who dreampt of being human. After happening upon a dying wizard she was able to become close to the human form she always dreamed of through a magical transformation that altered her shape and gave her exceptional magical prowess. After turning into her new form she was able to attract men and consume their magical essences, but she soon regretted this and decided to join the league of legends to repent for her actions on the field of justice. Corin Reveck was devastated from the death of her daughter Orianna, and created a robot with the same drive to compete in the league of legends as her daughter did. Annie is the daughter of the leaders of the rebellion in noxus. When she was two she encountered a demon bear outside the limits of the noxus rebellion colony. She then proceeded to enslave the demon bear with her powers. She now fights in the league of legends as one of its most powerful mages at the age of 7. Brother of Darius, a man who was not content with just having victory killing others in battle. No, Draven had to do it with flair. 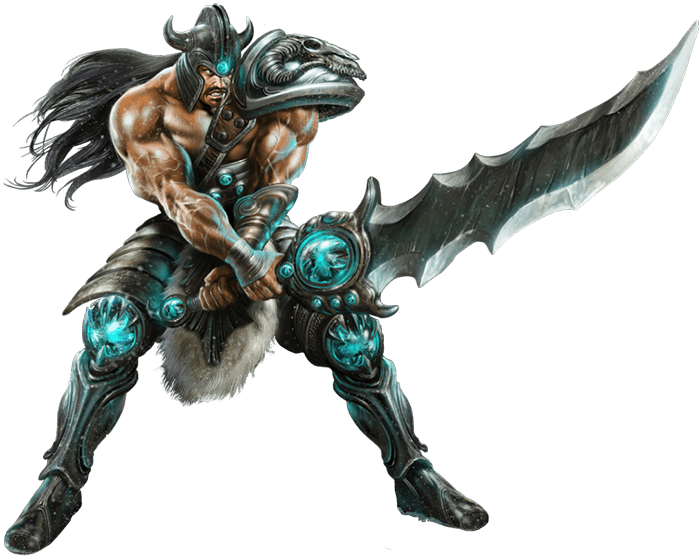 Draven before joining the league of legends was executioner for the noxian army, who decided to make a large show out of his executions that involved dressing up and making the prisoners to be executed run for their dear life while he threw axes at them from afar. 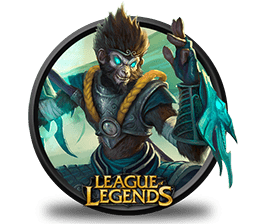 League of Legends is evolving so quickly and becoming one of the biggest known games of all – this is greatly enhanced due to global eSports coverage. New to the game? Read our popular tutorial. Want to be sure everything is humming along smoothly at Riot before coming in to play? Check the North American server status here. If their servers are down or Riot is having some other issue, you typically hear about it quickly here. Want To Meet Other LoL Players In San Diego? Join our forums. See you on the Rift!